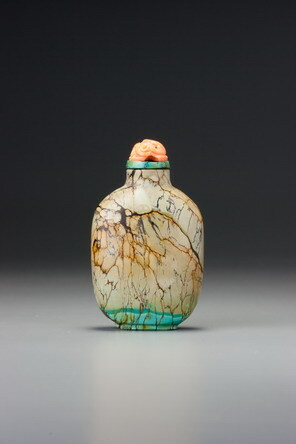 This bottle exhibits remarkable variation in the colour of the stone, proving beyond doubt that handling alone does not necessarily lead to greener material. Here the upper section is a rather dull greenish colour, while a band around the base is a brilliant sky-blue much closer to gem material. There is obviously no way that the upper section could have been handled while the base was not, particularly since the foot returns to the greener colour. The colour of the original material obviously varies considerably before any subsequent handling affects its appearance, although handling certainly does patinate the surface of turquoise, tending to turn it greener, whatever the starting colour is. 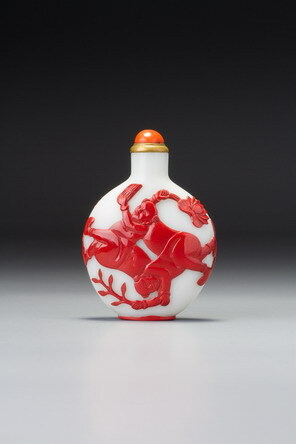 The bottle sports a splendidly suitable stopper, the turquoise collar picking up the colour around the base, and the carved coral cabochon providing a harmonious contrast.